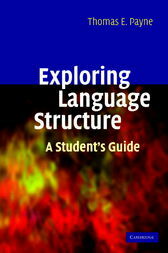 Designed for those beginning to study linguistics, this is a lively introduction to two key aspects of the structure of language: syntax (the structure of sentences) and morphology (the structure of words). It shows students in a step-by-step fashion how to analyze the syntax and morphology of any language, by clearly describing the basic methods and techniques, and providing almost 100 practical exercises based on data from a rich variety of the world's languages. Written in an engaging style and complete with a comprehensive glossary, Exploring Language Structure explains linguistic concepts by using clear analogies from everyday life. It introduces a range of essential topics in syntax and morphology, such as rules, categories, word classes, grammatical relations, multi-clause constructions and typology. Providing a solid foundation in morphology and syntax, this is the perfect introductory text for beginning students, and will fully prepare them for more advanced courses in linguistic analysis.